Cannot connect to a My Cloud Home using the Web, Mobile or Desktop App. Ensure the My Cloud Home device is using the correct power supply for the capacity purchased. Disconnect any external USB drives from the unit. Remove the power adapter plug from the unit. Insert the power plug adapter to power on the unit. Ensure the power LED is illuminated "Solid White and is not blinking. A blinking LED can indicate a Not Ready state. 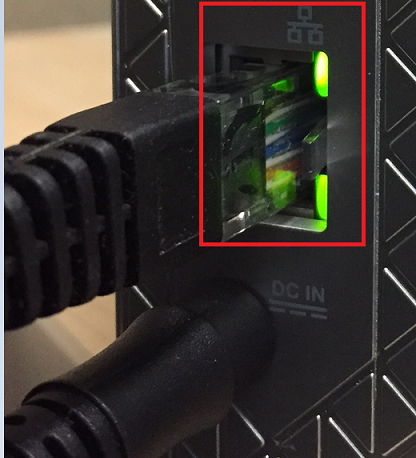 Ensure the Ethernet cable is plugged into the network router. Check the rear of the My Cloud Home and ensure the Ethernet cable is plugged into the Ethernet port, and that both Ethernet LED are illuminated or blinking. The LED on the top right is the "Activity" LED. It describes the activity happening with your connection by blinking or staying a solid color. When it is illuminated, the Activity LED is always green in color. The LED on the lower right is the "Link" LED. It describes if you have a network connection and at what possible speed, which is measured in megabits per second (Mbps). When illuminated, the Link LED may be amber (100 Mbps) or green (1000 Mbps) in color. 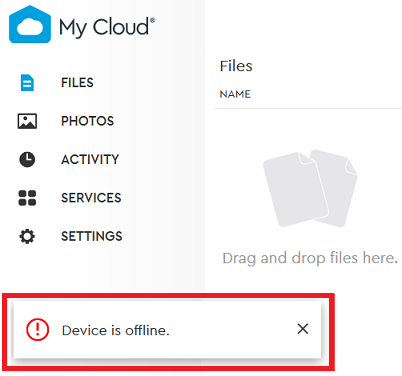 Performing a System Erase or change in Storage Mode requires a new setup process from MyCloud.com/hello or logging into MyCloud.com with your existing My Cloud Home Account. Reboot or Power Off and On the My Cloud Home. 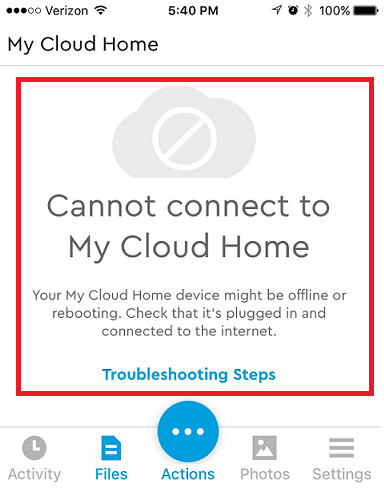 The My Cloud Home cannot be accessed using MyCloud.com or the My Cloud Home mobile app on Android or iOS without an active internet connection. Ensure the computer being used is connected to a network with an active internet connection. Ensure the mobile device being used is connected to a nework with an active internet connection. LAN Only connection is not supported for My Cloud Home mobile app. Reboot or Power Off and On all networking equipment including ISP Gateway Router, Wifi Router and network switches. Verify if the connection issue has been resolved. 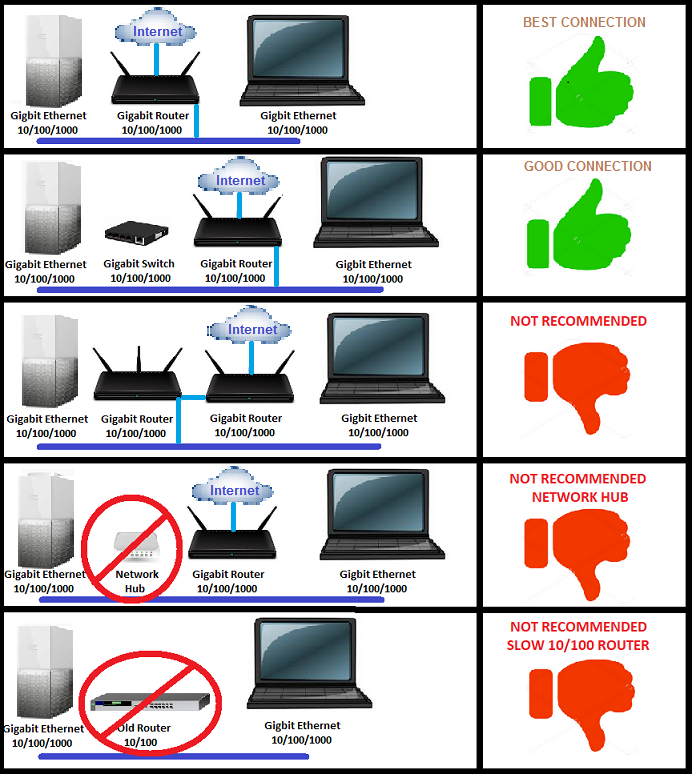 Use the chart below to ensure the My Cloud Home network environment is configured with the BEST CONNECTION possible. Network routers with built in Secure Access Firewalls or Parental Controls may be enabled or set at a setting that does not allow traffic to and from the My Cloud Home device. Set router Secure Access Firewalls or Parental Controls to the lowest possible setting. If the lowest settings does not resolve the issue, temporarily turn odd of disable Secure Access Firewalls or Parental Controls. Configure DHCP Reservation on the network router hosting the My Cloud Home to prevent the IP address from changing. Configure the router or gateway to use Google Public DNS Servers. Universal Plug and Play ( UPnP ) allows networked equipment such as personal computers, printers, Internet gateways, Wi-Fi access points, mobile devices and My Cloud to seamlessly discover each other's presence on the network. UPnP is intended primarily for residential networks. WD does not provide information on router UPnP support or instructions on how to enable UPnP on 3rd party routers. Please consult the router's user manual or contact the router manufacturer to determine if UPnP is supported and instructions on how to enable UPnP. 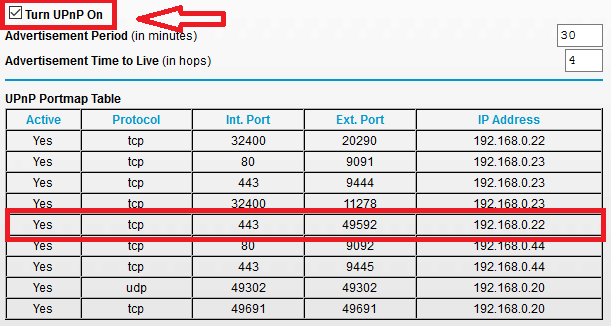 The My Cloud Home uses internal reserved port 443 and external non reserved port ranges from 40000-49999 which are normally not blocked by computer OEM firewall options. However, 3rd party firewall, malware, anti-virus, internet security and end point protection software may have default settings that block incoming network requests preventing a successful connection to the My Cloud Home. Temporarily disable 3rd party security software and check for My Cloud Home access again. 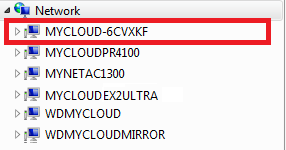 Connect the computer in question to a different network to determine if access to the My Cloud can be obtained. Download and install the My Cloud Home mobile app on your iOS or Android mobile phone and check network connectivity to your My Cloud Home in different modes to isolate the issue. If the LED is "Slow Breathing", the My Cloud device is "Not Found", "Not Detected" DURING A FIRST TIME SETUP or seen as "Offline" BEFORE any data has been added to the unit, please perform a 60+ (plus) second pin reset to set the unit back to factory defaults. Once the reset has been completed and the LED is "Solid White" and no longer "Slow Breathing", setup again at MyCloud.com/hello using the existing MyCloud.com email address and password. 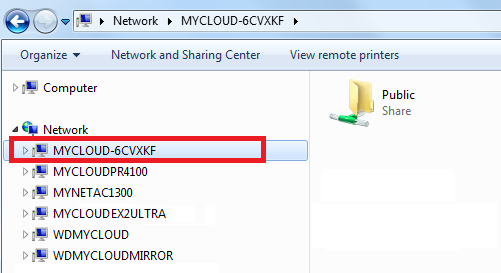 Check Windows Network Neighborhood do determine if the My Cloud Home "Public" share is visible. If the My Cloud Home is not present in Windows, please reference one of the articles below. Check macOS Finder do determine if the My Cloud Home "Public" and "TimeMachine" shares are visible.